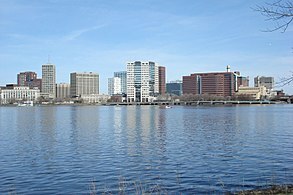 Massachusetts is a state located in the Northeastern United States. Municipalities in the state are classified as either towns or cities, distinguished by their form of government under state law. Towns have an open town meeting or representative town meeting form of government; the Census Bureau classifies towns as "minor civil divisions". Cities, on the other hand, use a mayor-council or council-manager form, and are classified by the Census as "populated places". Based on the form of government, there are 295 towns and 56 cities in Massachusetts. Some municipalities, however, still refer to themselves as "towns" even though they have a city form of government. There is no unincorporated land in Massachusetts; the land area of the state is completely divided up among the 351 municipalities. This map shows towns colored by the date they were incorporated in Massachusetts since the founding of Plimoth Plantation in 1620. Many of the towns and future cities shown covering the area of their original incorporation have since been divided into two, three or in some cases several smaller municipalities. 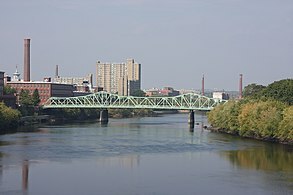 For example, Dorchester was incorporated in 1630 and originally included all of the current Dorchester, now the largest neighborhood of Boston, plus the Boston neighborhood of Mattapan, and all of present-day Quincy, Milton, Braintree, Randolph, Holbrook, Canton, Sharon, Stoughton, Avon and the northeast portion of Foxboro. Nearly all of Massachusetts territory had been incorporated by 1815, with the final three areas of Erving (1838), Gay Head (now Aquinnah) and Mashpee (both 1870) being incorporated from previously Native American land. Some towns and cities were annexed to others; disincorporated; or ceded to another state in their entirety. This list does not include territory changes affecting only part of a municipality; see History of Massachusetts. The town of Bradford was annexed to Haverhill, Massachusetts in 1897. The following towns joined the Connecticut Colony in late 1749 after separating from Springfield or just joining Connecticut. Due to general lack of colonial government there, all four towns in colonial New Hampshire chose to become part of the Massachusetts Bay Colony in 1641. They were ceded to the re-formed Province of New Hampshire in 1680, under a newly-issued royal charter. Numerous towns[which?] were ceded to New Hampshire after the Northern boundary of Massachusetts was defined by royal decree in 1740. All settlements in the District of Maine were ceded when the state of Maine gained its independence from Massachusetts in 1820 as part of the Missouri Compromise. Many municipalities have changed names. Wessagusset Colony Weymouth Norfolk Founded by Thomas Weston in 1622, 2nd oldest European settlement in Massachusetts. Incorporated as Weymouth in 1635 by settlers from the Dorset, England town of the same name. ^ The main source for the table is the Massachusetts Municipal Association 2009-2010 Municipal Directory Archived 2013-06-15 at the Wayback Machine. The MMA Directory is not an official state document, but is more up to date and specific than the official list from the Massachusetts Secretary of the Commonwealth's office, which is dated 03-11-2008 and does not include Palmer, Randolph and Winthrop, which have since adopted the city form of government. ^ a b "2009-10 Municipal Directory". Massachusetts Municipal Association. Archived from the original on 2013-06-15. Retrieved 2010-01-25. ^ a b "Population and Housing Occupancy Status: 2010 - State -- County Subdivision, 2010 Census Redistricting Data (Public Law 94-171) Summary File". U.S. Census Bureau. Retrieved 2011-03-23. 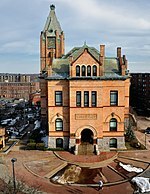 ^ "Massachusetts City and Town Incorporation and Settlement Dates". Commonwealth of Massachusetts. Retrieved 2009-05-06. ^ a b c d e f g h i j k l m n One of 14 municipalities with a city form of government that refers to itself as "The Town of". "Citizen Information Service: Massachusetts City and Town Incorporation and Settlement Dates". Secretary of the Commonwealth of Massachusetts. Retrieved 2016-08-11. ^ William O. Hultgren (Fall 2004). "Time Line for the Establishment of the Town of Charlton" (PDF). Charlton Historical Society Newsletter. Charlton Historical Society. p. 1. Archived from the original (PDF) on 2011-07-19. Retrieved 2010-04-22. ^ "Newton, MA - News Details". www.newtonma.gov. Retrieved 2016-06-10. ^ "Chapter 147 of the Acts of 2009". Boston: Massachusetts General Court. November 19, 2009. Retrieved 26 January 2010. ^ Archaic Community, District, Neighborhood, Section and Village, Names in Massachusetts. Massachusetts Secretary of State Citizen Information Service. Retrieved 2008 Apr 13. ^ "DIOTD, Mar. 10, 2009 Dorchester Territory". Dorchester Atheneum. Archived from the original on September 27, 2011. Retrieved 2009-08-11. 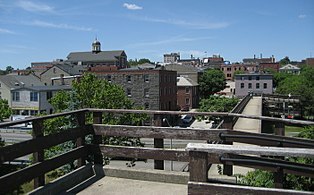 Wikimedia Commons has media related to Populated places in Massachusetts.